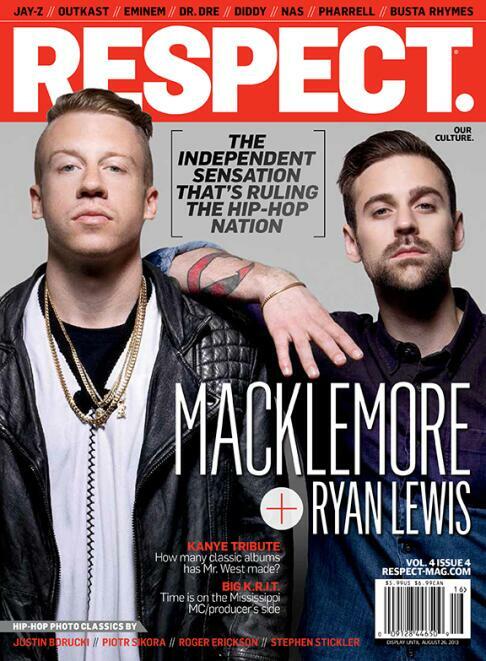 Photo of the Day: Macklemore & Ryan Lewis Cover RESPECT. Volume 4 Issue 4 | RESPECT. It’s our pleasure to bring you the latest cover of RESPECT. That’s Macklemore & Ryan Lewis staring you right in the face, ushering in a new direction for the music, the culture, and most strikingly, the living, breathing machine of the record industry. You can pick up RESPECT. Vol. 4 Issue 4 on June 18th–a good day eh? This edition features a bevy of legends: Jay-Z, Eminem, Nas, Dr. Dre, Outkast, Busta Rhymes, Diddy, and Pharrell make appearances, and that’s just the tip of the iceberg. UPDATE: Mack himself seems pretty excited about the issue: he retweeted us! That’s all y’all get for now. Be sure to cop when we drop on June 18. Is there any place where I can just buy this issue online? It’s not in stores yet, but when it is released, you can find it on Amazon or at Barnes and Noble’s website. Video: Macklemore & Ryan Lewis Make The Bus Fun : RESPECT. this was the first magazine in which Macklemore was the cover?